Repechage is an all natural and seaweed-based skincare company. Not only do they have full service spas all over the world but also a full line of skin and body products. That way you can get the same spa-quality products right in your own home. With a new baby at home, I am not getting away for a spa-vacation anytime soon (le sigh!). So, having a nice and pampering treat on hand has been nice! 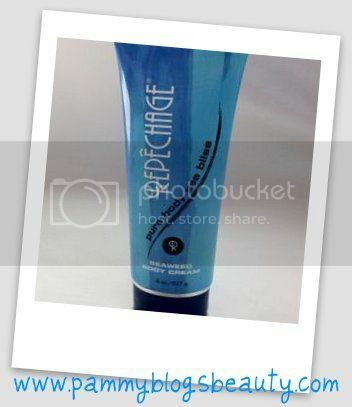 For this review I have been testing out the Repechage Pure Body and Sea Bliss Seaweed Body Cream. This cream is so nice! To me, the texture reminds me of half-way between a body butter and a body lotion. The cream is thick and rich without being overly sticky or tacky. I apply all over my body after a bath or shower and on dry elbows and hands throughout the day. After application, my skin instantly feels hydrated and looks smooth. It has an ever-so-slight and subtle scent. Maybe I am even imagining it, lol, as it is so light. The cream's formula features sea plants rich in Vitamins B12, C, E, and Beta Carotene, 18 amino-acids, and 42 trace elements. It also contains aloe vera, gingko extract, select sea seaweeds (natural sources of Vitamin B complex and minerals) and lavender oil. This rich cream has been a nice and soothing treat for my skin!